I can do it…Really? – My thoughts on a page. Ever get flat pack furniture? Who puts it together in your house? Here is our story. Names have been changed to protect anonymity! A new bed was purchased and duly arrived at the house in little and very large pieces, with a sheet of paper attached. Some were of the opinion the paper are surplus to requirement, perhaps placed there in error or only for those without the intelligence to do a simple job. Others in the house said nothing. Experience would say that there are only two members of the house with a proven record at assembling items which shops deliver in pieces. Neither of those two were invited to the assembly. Echoes of “It looks fairly straightforward,” filled the air. There was a big push on to have the bed up and ready by the time the occupant wished to sleep in it, so ‘fairly straightforward’ got to work. Hours passed. All help was refused. By midnight it was finished. Others in the house were amazed. First time ever. The next morning others could not stop speaking of how wonderful ‘fairly straightforward’ was. The future looked bright for pieces of furniture arriving in pieces with paper attached. It was time to make the bed up. Too lazy to pull it out others knelt upon it to put on the sheet. There was a loud, rather sickening crack, followed by a definite dip in the bed, right underneath where the knees were sitting. Carefully disembarking, a quick check of the frame revealed a broken slat. It would appear the frame had been assembled upside down! ‘Fairly straightforward’ said, “Fair play to you for figuring out what was wrong. Three hours later the bed had been taken apart fully, all screws removed, the broken item discarded and the bed re-assembled. There was much groaning, moaning and hissing involved. Others in the house agreed, it will definitely never happen again! Posted in education, Family, humor, life, marriage, personalTagged DIY disasters, Flat pack assembly, reading instructions. I won a writing prize! I think only those who can make jigsaws should be allowed near a flat pack. Co incidentally I am excellent at jigsaws! They can be so frustrating though, just one thing wrong and, feck….to put a well used Irish word on it. Maybe ‘fairly straightforward’ will learn, in time? DIY furniture is evil. I’m impressed you got out with your lives. Didn’t take everyone long to realise the best plan was to leave any and all flat-pack furniture to me. Mr. “Instructions are for losers” ended up having to beg for my assistance. Sent him (flat) packing, took the disaster apart and had it all done in less time than he’d spent on it, and without all the colourful language. I didn’t rub it in. Well, not much. Haha. Well done. Yes we all have our strengths. I’m afraid I just really wanted not to have to do it, but lesson learned! Himself did this? Are you mad???? I don’t know what I was thinking Colleen. I paid dearly for my moment of madness. It’s okay. It’s okay. You seem to have come out of it. Breath. I am that company here. I think I temporarily went on strike, but never again. Wouldn’t it be great to have the money to buy what you wanted and then phone someone to assemble it? Indeed. Although it looks lovely now! Good. Nobody hurt too bad, I trust. Making the bed frame upside down is incredibly inventive, Tric! He should be very proud of himself. Perhaps next time he gets to work on a flat pack bed, he can go all out and assemble it as a wardrobe or something. We actually love making flat pack furniture here: we find it a calming activity, all you do is follow the instructions to the letter and the result is completely predictable! Therein I believe we have the problem identified…”Follow the instructions to the letter”. 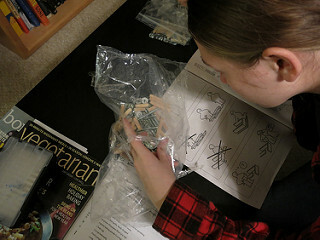 I don’t mind doing flatpack, but I can’t say I find them calming. You must be great at jigsaws.